Orders for in-stock items placed before 2pm EST are shipped the same business day except for Special Order items that are shipped directly from the manufacturer such as Personalized Titeliest golf balls, items that are embroidered in any way and any items that may be dropshipped from the manufacturer. Please see more details below. Items shipped from us are shipped from our warehouse in Tampa, FL - zip code 33614. Orders with in-stock items that are embroidered take 3-5 business days to ship after any applicable logo approval process is complete. Orders with large quantities of embroidered items may take longer to ship. Any air shipping method you choose for orders with embroidered items will be delayed by this timeframe. Therefore, if you choose Next Day Air shipping, for example, you will not receive your order one business day after your order is placed, as it takes extra time to customize the items on your order. In this case, you will receive your items one business day after it ships, which will be in 3-5 business days after your order is placed, in most cases. Embroidered items are not eligible for return or exchange. Personalized and Logoed Titleist golf balls (Special Order Items) are shipped directly from the manufacturer in 3-4 weeks. We will email you tracking information when it becomes available from Titleist. Personalized and logoed golf balls are not eligible for return or exchange. Items that are shipped directly from the manufacturer, as noted in your shopping cart and on the item's web page, can only be shipped via Ground Shipping and only to the Continental United States. Please allow an extra 3-5 business days for these items to ship from the manufacturer. We will email you tracking numbers for these items as soon as they become available to us from the manufacturer. Orders placed after 2pm EST on Fridays for in-stock items are not shipped until the following Monday. This includes overnight shipping, so in this case, if you choose overnight shipping, you can expect the package to be delivered on Tuesday. Overnight shipments do NOT include Saturday or Sunday deliveries. Saturday and Sunday or UPS Holidays are not considered shipping days for any method of shipping. Please see the map below for UPS Ground shipping transit times. The day that your order is shipped does not count as a shipping day. So if your order is shipped on Monday - Tuesday is day one, Wednesday is day two and so on. 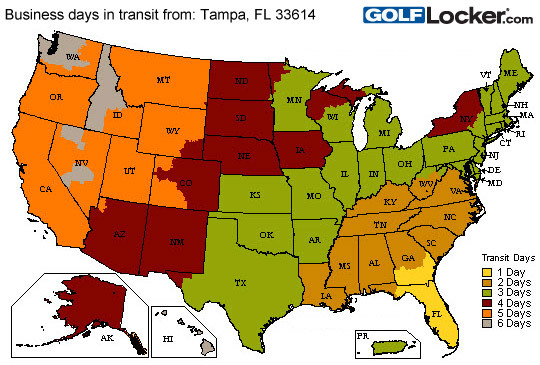 The map below shows UPS Ground transit times for orders shipped from our location in Tampa, FL. UPS Ground shipping days are NOT guaranteed, so please keep that in mind. Shipping could take extra days than the guideline map below when shipped via UPS Ground. Please remember that the day your order ships is not day one. If your order ships on Monday, then Tuesday is day one, Wednesday is day two and so on. For Economy Ground shipping, which may be delivered by the USPS or UPS, please add 1-3 business days to the UPS Ground transit times via the map below to estimate your delivery day. Economy Ground is not a guaranteed shipping timeframe.